> Air Compressors & Accessories. > Power Tools & Accessories. > Pressure Washers & Accessories. 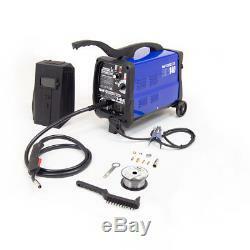 Wolf Professional MIG Welder 140 Turbo Fan Cooled Gas/No Gas Kit 135amp. ORDER BY 3.30PM FOR SAME DAY DISPATCH. This smooth DC output welder offers both gas and no gas MIG welding, and is easily interchangeable between the two. With simple polarity changing (requiring no tools). Supplied with all the accessories needed to start gas or no gas MIG welding. Youll not fail to be impressed with the performance of this machine. If youve never had a DC output welder, youve never experienced just how straight forward obtaining good welding results can be. The in built turbo fan cooling allows for extended welding duty cycles and includes transformer thermal overload protection circuitry. Gas Combination Welder Kit Includes: - 1 x Mini spool of flux cored MIG wire - 2x Spare MIG tips - 1 x Spare Torch Shroud - 1 x chipping hammer/wire brush - 1 x hand held face shield. Technical Specification: Welder Type - MIG Gas / No Gas Min. Amps - 30 - 135 Amps Selectable Power Setting - 6 Mild Steel Welding Wire Sizes - 0.6mm / 0.8mm Flux Welding Wire Sizes - 0.9mm DC Output - Yes Thermal Overload Protection - Yes Non Live Torch - Yes Turbo Fan Cooled - Yes Amps at 60% Duty - 43 Input Voltage - 230V Phase - 1 Power Supply - Will operate from a 13A supply at the lower power setting Wheel Mounted - Yes. Deliveries are made Monday to Friday by our chosen carriers a signature is required. If you wish to return a product for any reason, you may do so within 30 days of receipt. OPEN 6 DAYS A WEEK. Visit our warehouse at: NG17 7LF. The item "Wolf Professional MIG Welder 140 Turbo Fan Cooled Gas/No Gas Kit 135amp" is in sale since Friday, November 17, 2017. This item is in the category "Business, Office & Industrial\Metalworking/Milling/Welding\Welding & Soldering\Welding\Welders, Cutters & Torches\MIG Welders". The seller is "ukhomeshopping" and is located in Kirkby In Ashfield. This item can be shipped to United Kingdom.